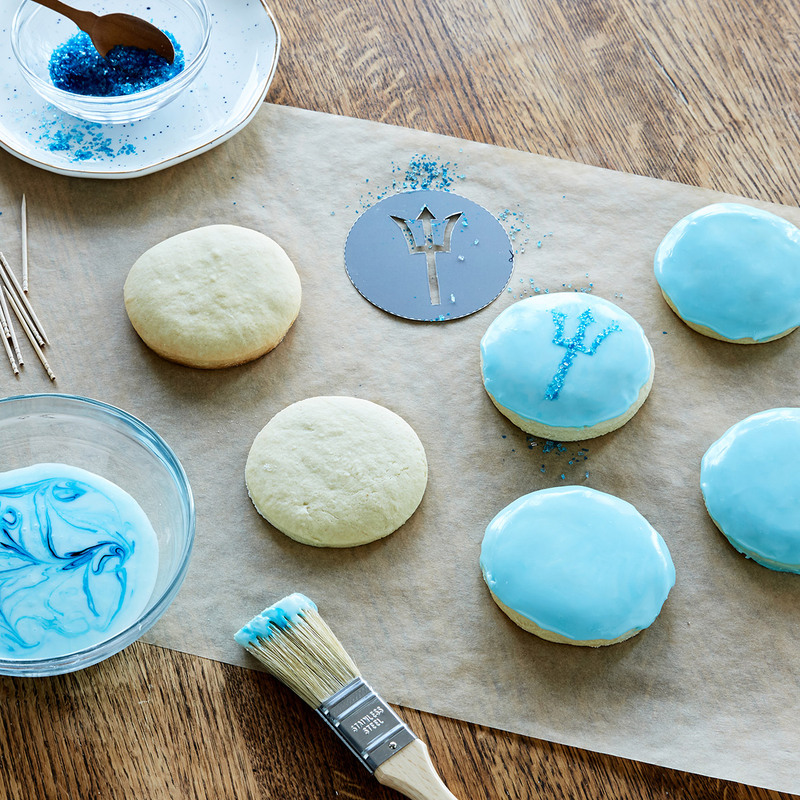 In honor of the Percy Jackson & the Olympians series by Rick Riordan, here is a fun recipe for sugar cookies, topped with a shiny blue trident that belonged to Percy’s dad, Poseidon, the god of the sea. Tip: Some people like to make their cookies a day before serving and freeze them overnight so they’re nice and cold when it’s time to ice the cookies. Adding a stencil to icing makes sugar cookies extra special, and you can download our easy how-to here. Preheat oven to 350 degrees Fahrenheit. Slice the butter into 1-inch pieces. Place the butter and sugar in the stand mixer and set to medium. Mix until the butter and sugar are evenly combined. Slowly add the eggs one by one. Add the salt and clear vanilla extract. Add the flour in one batch, but cover the mixer with a towel to contain it. 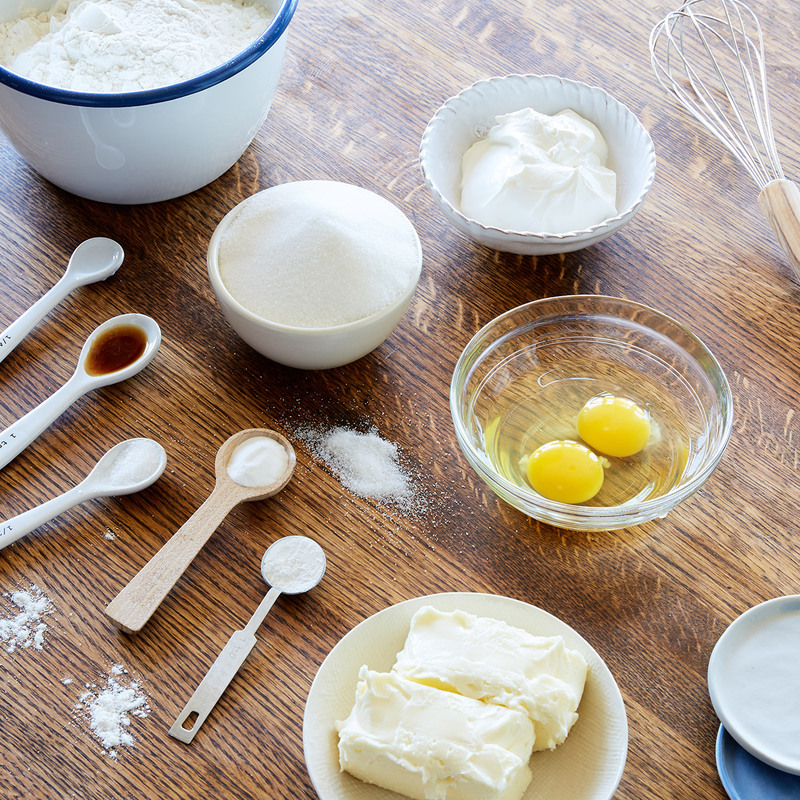 Mix until the flour is evenly combined with the other ingredients. Remove the cookie dough and place it on a lightly floured surface. Roll out the cookie dough to ¼-inch thickness. 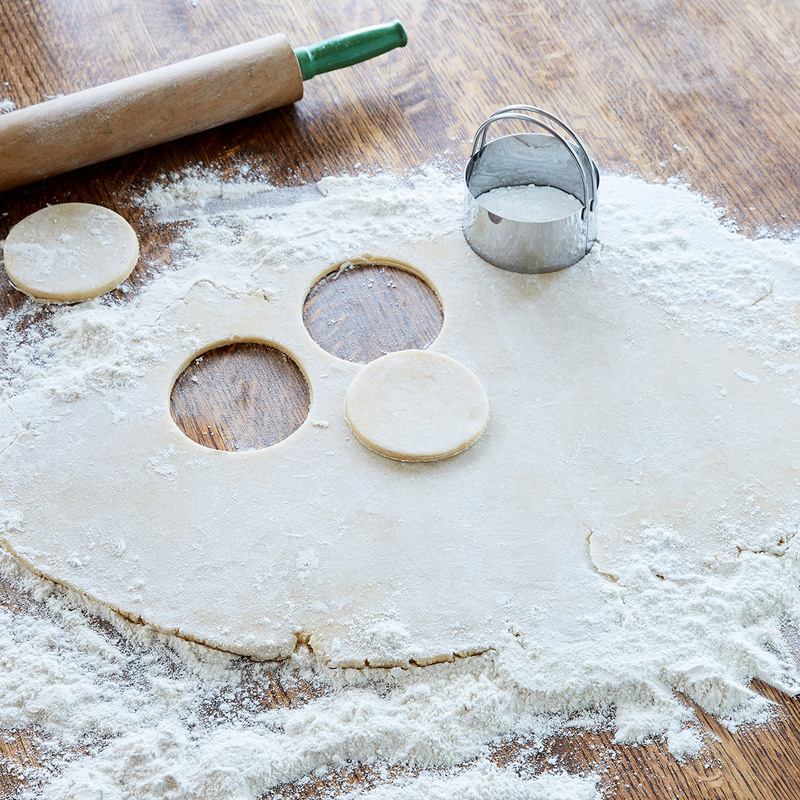 Use the cookie cutters to shape the dough into perfect circles. Place the circles on a cookie tray lined with parchment paper and let them cool in the refrigerator for one hour so they don’t lose their shape. Bake for 10 minutes or until edges are golden. Remove the cookies from the oven and place them on a cooling tray until they are cool enough to add icing. Pour the water into a mixing bowl and add the meringue powder. Whisk for 30 seconds. Add the cream of tartar and continue whisking for another 30 seconds. Pour the contents from the mixing bowl into the stand mixer with the paddle attachment and set to low. Add in the sugar and food coloring and continue to let the ingredients mix on low for 10 minutes until icing begins to look glossy, but make sure it remains somewhat thick so it’s easy to ice your cookies! Make sure your cookies are completely dry. Using the paintbrush, gently add the icing; then let the iced cookies cool in the refrigerator. Once they are cool, pull them out and gently place the stencil in the center of each cookie. 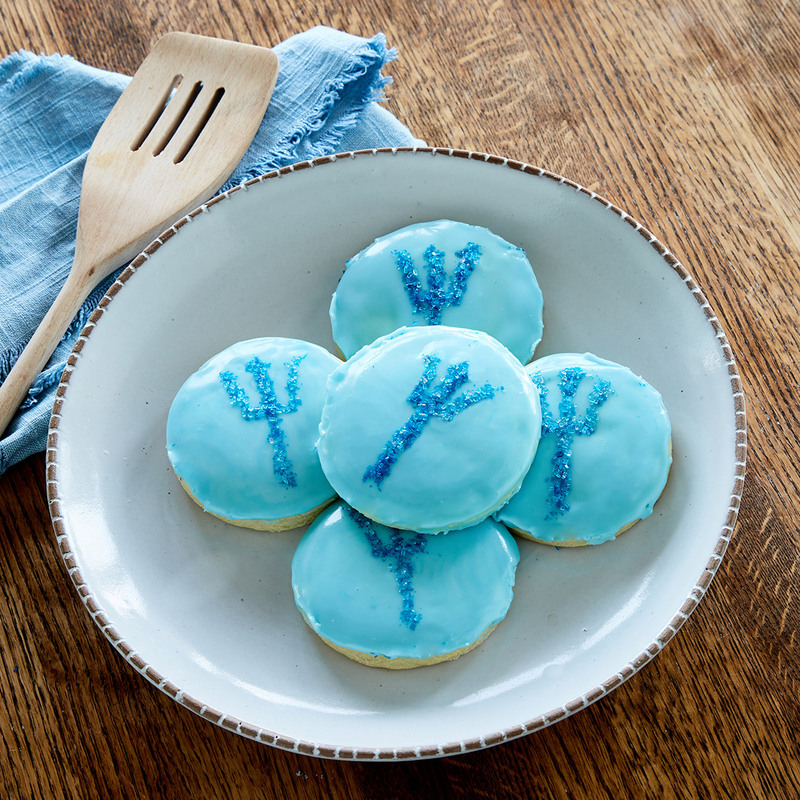 Sprinkle blue sugar crystals carefully onto each cookie; you can use your finger to lightly tap the sugar crystals into the icing. Enjoy!